The gem in the foothills of Kumaon region, The Naini Retreat is a heritage hotel located in the heart of resplendent hill station, Nainital. The former residence of Maharaja of Pilibhit, this luxurious resort boasts of its splendid architecture, gorgeously landscaped premises, dazzling picturesque panoramas and bountiful onsite leisure activities. This marvel of Leisure Chain of Hotels arranges thrilling outdoor activities including mountaineering, rappelling, yacht ride in the lake, trip on a cable car, and many more on special request of guests. An onsite well appointed banquet often hosts seminars, training sessions, press conferences and small get-togethers, is relished by guests. Embrace the regal lifestyle of the maharajas while you abode in any of the 37 elegantly furnished accommodations of The Naini Retreat Nainital. Equipped with all modern amenities the guestrooms are categorized into 6 distinct categories, namely Standard Rooms, Deluxe Rooms, Duplex Rooms, Garden Facing Rooms, Lake Facing Rooms and Family Suites. The wooden flooring and intricate interiors adds to the grandeur of these luxe rooms. 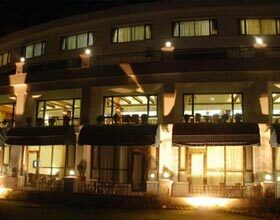 As awe-inspiring as the serene Naini Lake, the restaurants at The Naini Retreat Nainital exalts of its chees finesse in plating the scrumptious cuisines from Indian, Chinese, Mughal and Continental fares. Dining at The Maharaja Restaurant is a multi- culinary feast with signature savory delicacies from Kumaon region in its menu. Garden Cafe n Grill is a delight with lip smacking barbeque and grilled dishes served with exotic cocktails. Snuggle down in the Garden Cafe or Stella Bar to enjoy the intimating moments with closed ones while to taste the refreshing espresso or classical wines respectively.